Thermally insulating double and triple glazed polycarbonate dome rooflights for flat roofed open plan kitchens, bathrooms and hallways or other areas within the home or commercial buildings. 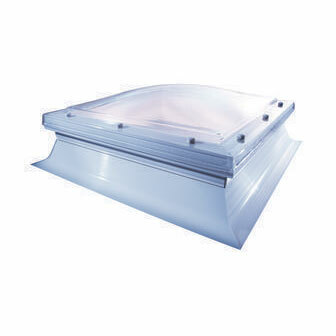 Available in 6 sizes and supplied as an opening or non-opening dome with an insulating PVC kerb. Rooflight size = finished roof opening size. Measure overall dimensions of the opening (length x width). Standard dome sizes are show above. Triple glazed polycarbonate dome rooflights achieve a centre pane U-value of 1.8 W/m²K and complies with the requirements of Part L of the Building Regulations. The Mardome Hi-Lights range comes with secure fixings with tamper proof caps for added security. The robust white PVC kerb is thermally insulating. The ultra clear and resilient polycarbonate glazing has added UV protection for long term performance. This service is only available to mainland GB (excluding postcode areas beginning KW, IV, AB and PH). To qualify for 48 hour delivery all orders must be received by 2pm.